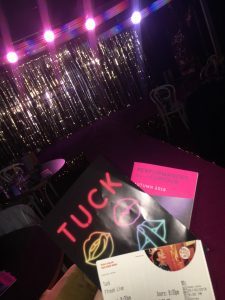 I was given the opportunity to attend the opening night of ‘Tuck’. This play is part of the Performances for the Curious season in the Wales Millennium Centre, celebrating our differences in society through a range of performances from comedy to cabaret. Theatre company Neontopia, in association with the WMC, bring ‘Tuck’ to the stage of Cardiff – from 24th October to 3rd November. 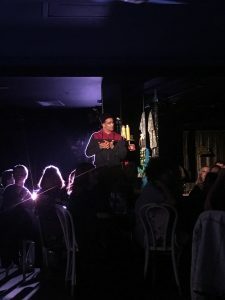 The bilingual show was written by Alun Saunders, previously celebrated for his most acclaimed work ‘A Good Clean Heart’ – this time giving us the story of 4 drag queens, presented at the Fresh Cabaret Bar. Behind the expected sparkling sequins and sassy smiles, hides a heart breaking message of mental health. Within the show comes another show, with all queens performing renditions of classic songs and comedic interaction with the audience. Its uplifting and enjoyable performance makes the later, loneliness and despair of the play even more shocking. Before the show, playwright and also drag queen himself, Alun Saunders gave an insight on his inspiration for ‘Tuck’. Telling the story of a drag queen who took her own life due to depression. The four stars of the show were brilliantly cast, all demonstrating their acting abilities through the sheer range of glamour to gloom in the considerably short play. Stifyn Parri as Patsy Thatcher, who delivers a sarcastic, savage personna on stage, while behind closed doors is dealing with his husband’s death and the effects of being a lonely alcoholic. His partner in crime Martha Titful, played by Iestyn Arwel, a powerful drag but powerless when witnessing Pats’ growing darkness and clearly heavily affected by his suicide. I noticed that each character had their own issues to deal with in the play which shows how people become distracted and oblivious to the issues that others have around them. I found it very effective that there was a very subtle plot twist that had its own message. Initially, I thought the play was orientated around Medusa Massid, who was clearly struggling with finding his/her identity. The issue of discrimination was addressed as this character, played by Lewis Brown, demonstrated a stigma around drag and showed a feeling of embarrassment when someone he loves finds his dresses. 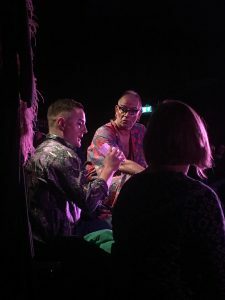 The final character, the most out-there of them all, Lola Bipolar, played by Gareth Evans was both the youngest and newest to the Cardiff drag scene. Through a sense of comedic ‘dumbness’ in this character, it gave some quite intense scenes a bit of ease. An overall of the play highlights that it has been carefully scripted and incorporating the welsh language made the context of the show really hit home as it is never often you are aware that these things are happening all around you. Do not worry if you are not a welsh speaker, like myself, translations are included in the scenes itself. Medus Massid is from London and therefore often interrupts heartfelt moments in the action to consult with Lola to understand what is happening in the scene, which added to the natural humour in the play. Besides the slight problem with sight line issues due to the venue, the play as a whole had so many elements of fun, glamour and comedy, celebrating pride and identity. I left after feeling so many emotions and sensitive to the effects of mental health and I believe his was the effect Alun Saunders wanted to have on his audience.